Set in the foothills of the Caucasus mountains sits a city by the name of Vladikavkaz. In the centre of this city there is an avenue lined with lime trees and all along the length of this leafy promenade - beneath those trees - sit wooden benches painted golden yellow in various states of repair. 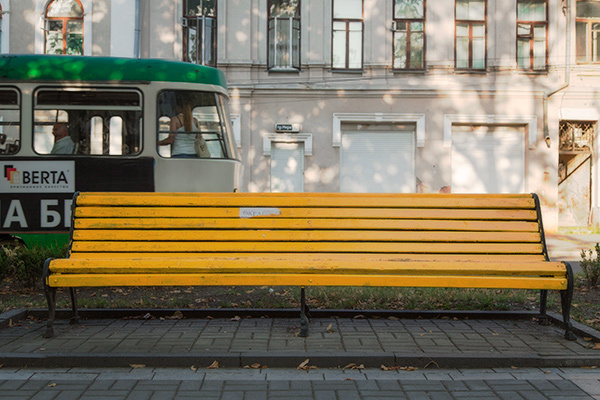 On these benches, people of all ages stop and rest and watch the passersby. As with many places around the world, celebratory helium balloons can be found being used to mark all manner of events. Vladikavkaz is no exception. 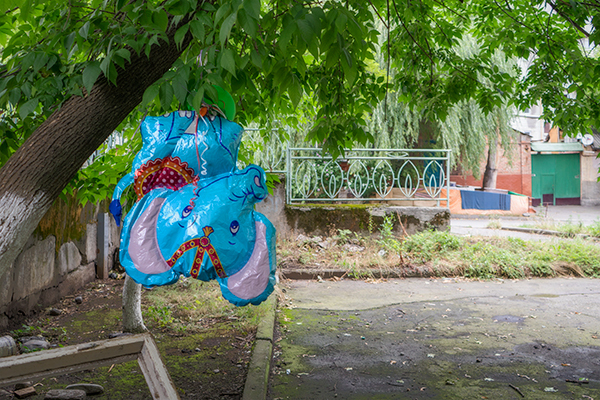 Every day I discovered hapless balloons like the baby boy balloon, aptly located just outside the paediatric hospital snagged on the eletric overhead cables of the city's tramline or the silver heart on a telegraph pole on the path next to the River Terek or the blue elephant looking forlorn hanging upside down outside a derelict house. All these balloons are memories of celebrations or events. Every time I find a dead balloon, I find the memory of an event that was. A few days into my visit I arranged for one of the benches located in the central avenue to be moved to the space where I was working where it was situated in front of the recently discovered elephant balloon that now lay inert and crumpled on the gallery floor. The bench used for staring at passersby was reassigned in purpose for viewers to contemplate this now dead balloon; for what do we see when we stare into the void that is the death of celebration but a passing reflection of the decay in our own memories of self.